The Wide Field Camera 3 of NASA’s Hubble Space Telescope and MAVEN Spacecraft has captured image of a comet that sprayed thousands of shooting starts that looked like layers of fine dust on Mars as it passed its atmosphere. The spawned stars caused the skies of Mars to turn to shades of yellow with layers of ionized particles of vaporized sodium in the form of comet dust. The comet, named Comet Siding Spring after the Australian observatory that discovered it last year, passed by Mars on October 19 at a distance of 87,000 or 139,500 km. This distance is just half the distance between planets Earth and Moon, which happens to be 10 times closer than any comet has ever passed Earth. Having moved on its course from Oort Cloud, which is actually a body way beyond Neptune and comprised of components that were part of the solar system during its formation some 4.6 billion years ago. 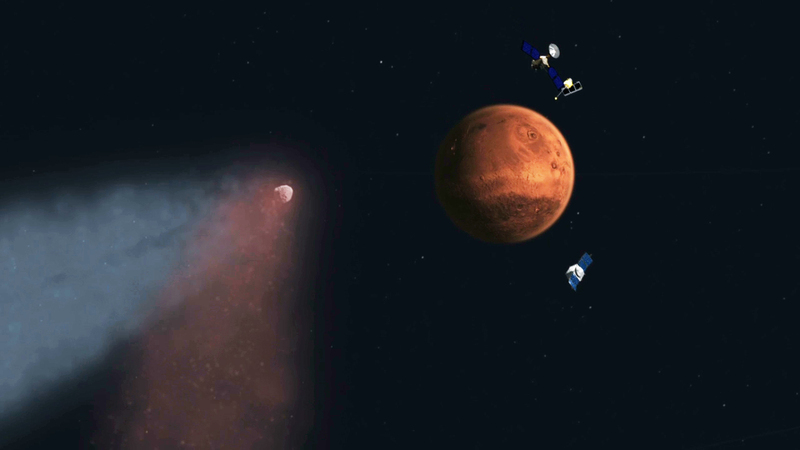 The team at NASA was able to particularly study the act done by Comet Siding Spring against Mars by deploying robotic spacecraft to circle Mars at the time of the occurrence. In order to protect its equipment from the abundant layers of dust sprayed against Mars by Comet Siding Spring, NASA moved back its orbiting spacecraft behind Mars to shield it, and according to Jim Green, “I really believe that hiding them like that really saved them. We ended up with a lot more dust than we ever anticipated.” After some analysis of the layers of charged particle dust was done, it was discovered to contain element of iron, magnesium, and other metals. MRO’s Compact Reconnaissance Imaging Spectrometer for Mars (CRISM) also observed the comet to see whether signs of any particular chemical constituents stood out in its spectrum. Team members said the spectrum appears to show a dusty comet with no strong emission lines at their instrument’s sensitivity. In addition to these immediate effects, MAVEN and the other missions will continue to look for long-term perturbations to Mars’ atmosphere. Oh man. Missing pixels, that’s all, they don’t need to be oval. Nice try though.